I was there for a weekend by myself and I enjoyed everything of the hostel! Great structure and great people in a perfect position for visit Dublin! Perfect position, staff and other guests were very friendly. Both the toilets and the room were pretty clean. Breakfast was good too. My bed wasn't very comfortable, but I think it was just mine since it was the only one screeching at any movement in the whole dorm. Should I be back in Dublin I'd definitely stay here again! Posizione ottima, staff e altri ospiti molto simpatici, stanza e bagni puliti. Colazione abbondante, solo il letto un po scomodo, ma credo fosse solo il mio. Ci tornerei. 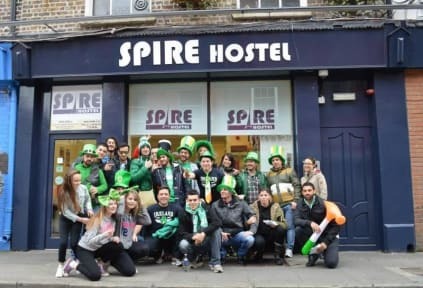 Very close to O'Connell Street (one of the main streets of Dublin) and very clean (bathroom eapecially), all the rest is good too...reccomended! Good atmosphere and good breakfast! I enjoyed the free beers on Saturday night! Toilet clean but a little bit smelly from the restaurant downstairs. I will definitely recommend it. Non è l’ostello più economico del mondo, nè il più bello esteticamente però offrono una colazione molto abbondante, la posizione è decisamente perfetta, il personale è gentile e i bagni vengono puliti davvero molte volte al giorno. Consigliato!